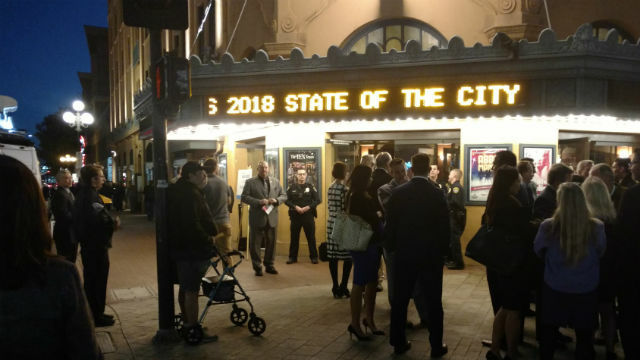 San Diego Mayor Kevin Faulconer said Thursday the city’s three biggest challenges are homelessness, housing and sustaining the overall quality of life, and promised a new approach to each in 2018. He made it clear that he supports the Dreamers, wants to “preserve NAFTA” and backs a clean energy future. 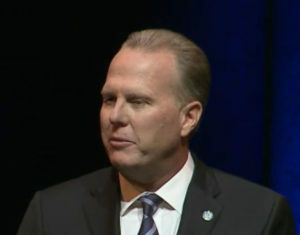 He pledged to continue “San Diego’s traditional culture of collaboration” whatever happens nationally. The mayor spoke before hundreds of business and political leaders, including representatives of the Navy, Marines and Coast Guard, as well as his big-city counterpart across the border, Juan Manuel Gastélum, the mayor of Tijuana. On homelessness, Faulconer committed to establishing a central “Housing Navigation Center,” located at 14th Street and Imperial Avenue, where homeless people will have one-stop access to services. “America’s finest city will no longer tolerate a sidewalk, a tarp or a riverbed as a home,” he said. He said the three bridge shelters set up over the past two months are an example of new approaches to homelessness. But he also said the city would not tolerate individuals who refuse shelter and services. “We must reduce homelessness, not enable it,” he said. Turning to housing, Faulconer said it was time for the city to change its rules to encourage more and faster housing construction, and in more variety. “Countless government regulations have been created around the premise that more housing is the cause of our problems,” he said. He promised legislation to allow smaller units, faster development near transit stations, and zoning changes to encourage live/work units. “If you’re in the business of building homes, we want to put you to work,” he said. To maintain the city’s quality of life, Faulconer pledged to fill vacancies on the police force, continue an aggressive program of resurfacing streets and building new public facilities, and — most importantly — finally expand the downtown convention center. “A decade ago the city only repaired 25 miles of streets in an entire year. Now that’s about how much we fix in a month,” he said. He called the upcoming ballot initiative to expand the convention center while raising additional funding for street repairs and homelessness the most significant action of 2018. “The convention center expansion is the single most effective way to strengthen our economy,” he said.